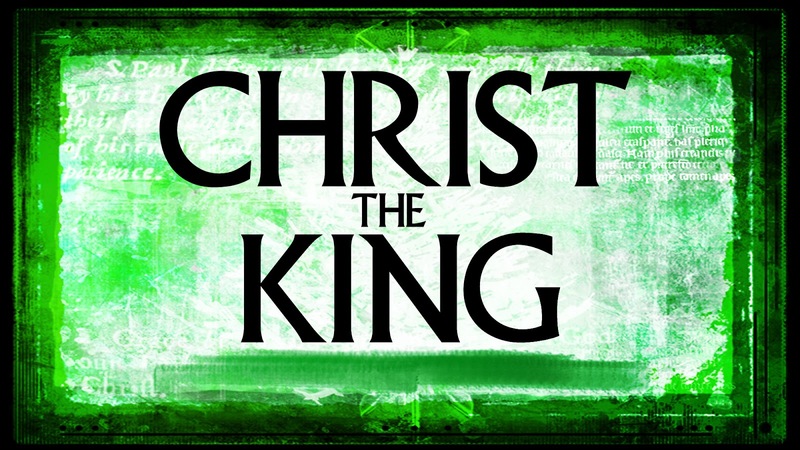 Christ The King Sunday - "The King Is Coming"
Today we are celebrating what has come to be known as Christ the King Sunday--the Sunday before the beginning of Advent. 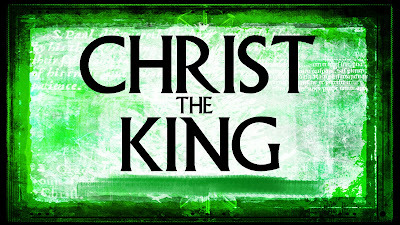 Since it is Christ the King Sunday, I got to thinking about what it would be like if I were king. Which is kind of how my mind works. So, I thought I would share with you a bit of what I wrote. You can call it, "If I Were King: A Treatise to Whomever" by Leon Bloder. I hope you like it. If I were king, I would immediately make the following things sugar and calorie free: chocolate candy bars, particularly anything Reese's, chocolate chip yo-yos from Publix, red velvet cake, kettle potato chips, most beers, bread, latte's from Starbucks, extra large coffees with cream and sugar from Dunkin Donuts and everything at Donut King. If I were king I would make the following things illegal: driving when you can't see over the dash, medians that make you drive four hundred blocks to do a u-turn, the SEC Network, phone trees, the IRS, the Kardashians and of course Justin Beiber albums. If I were king I would require the phone company, plumber, cable company and all delivery drivers to narrow the window of their arrival to ten minutes. So instead of having to wait from 9 until Noon for your monthly delivery of Justin Bieber albums, you would only have to wait from 9:00 to 9:10 AM. I would require all garbage trucks to play songs on their loudspeakers that make them sound like ice cream trucks, just so I could see the disappointment on the faces of small children who come running at the sound of what must be the ice cream only to find someone tipping their garbage can into a truck. That's so funny, man. Come to think of it, there would be a lot of things that I would probably do as king that wouldn't make a lot of sense. So why don't you imagine this with me for a moment. Think about the things that you would do if you were king. Tell the person next to you--they want to know about it, I am sure. But come to think I would also do some things---some other things in all seriousness. I would do some things that need to be done. I would eliminate poverty and hunger. I would eradicate disease. I would get rid of all of the weapons in the world, and make all of the people who hate each other and are using them to sit down in a room and listen to one another's stories for a while. I would find a way to do away with racism and sexism and ageism and homophobia and all of the fears that create those kinds of things. I would find a way to get all of the churches all over the world to put aside their differences and the stupid things that divide us to just join together to do good in the world and just be the church. I would make this a world safe for children, full of hope, creativity, joy, love, peace and the best of everything. That sounds good doesn't it? Because, let's face it. The news has not been all that good lately. The Syrian civil war has destroyed an entire country, and displaced millions of people who are fleeing for their lives. There is nothing for them to go back to. Their cities are gone. Villages gone. And those who are left, they are trapped between a totalitarian regime propped up by the Russians and a totalitarian regime propped up by terror, fanaticism and fear. The streets of Paris have become a war zone. Over 150 people dead, and more terror cells are being discovered. There was a bomb plot uncovered in Germany that could have killed thousands. Another group of terrorists were arrested in Turkey on their way to Germany. The streets of Belgium are awash with fear and tension. Over two hundred people fell from the sky in a Russian airliner that was bombed by fanatics. Nearly 150 students were massacred by Islamic fanatics in Kenya this past week. Another 50 killed in Beirut when a terrorist detonated a suicide bomb there, and another nearly 20 killed in Iraq the same way. 2 mass murder plots were thwarted in the US this past week--one by a couple of racists from the KKK and one by a 19 year-old kid with the last name of Sullivan from NC who wanted to kill a whole bunch of people in the name of ISIS. We're not doing good, are we? So what has been the Christian response to all of this? I have to tell you that based on my own social media, and what I hear on television from pundits and politicians who are avowed Christians---the response has been pretty poor. What I have seen from so many Christians is a great deal of handwringing, anxiety, fear and anger. I've seen a lot of lashing out as well--Christians attacking other Christians, arguments over what the Bible really says about war, refugees, the end times and a host of other stuff. I've also seen a fair amount of dread from Christians who have become convinced that this is all a precursor to the end of the world. HAVE YOU HEARD THE GOOD NEWS? JESUS IS IN CHARGE! I know those words haven't really come out of my mouth. Have they yours? But those words are essentially what the earliest Christians proclaimed when they were going through times of crazy uncertainty, strife and conflict almost two thousand years ago. This letter, which we know as the book of Revelation, was written by John the Revelator, who could have been John, the Apostle, the disciple of Jesus or perhaps an early church leader and prophet. It was written to seven churches, which were located largely in what is now modern day Turkey. It's a strange letter, to be sure. It's full of word pictures, exhortations, visions of another world, the end of days and so much more. What it isn't is a code meant to determine the future. The entire point of the book of Revelation is aimed at Christians in troubled times. The point is: how to stay faithful and hopeful as Christians in bad times. The news surrounding the historical context of the book of Revelation was pretty bad. There was war, destruction, plague, and the persecution of Christians. There was violence and terrorism, and what we would now call the Middle East was a hotbed of both. I am so glad that things have changed, haven't you? So this letter starts off with a vision--of Christ as King. This is the fulfillment of Jesus' own words: "All authority on earth has been given to me." The author of this letter describes Jesus as: "one who is, the one who was, and the one who is still to come." New Testament scholars describe the language used here as "street Greek," slang meant to be provocative, earthy and real. Essentially the author is saying, "The is, the was and not yet." Jesus is called "the faithful witness," and "the first to rise from the dead." Jesus himself says, "I am the Alpha and the Omega, the beginning and the end..."
It's basically a throw down. It's like Muhammed Ali's famous rants before a fight. "I am the greatest!" "I float like a butterfly, I sting like a bee!" It's Joe Namath predicting that the Jets would beat the Colts in the Super Bowl. It's hip/hop star Drake starting the song Forever off by saying, "Last name Ever, first name Greatest like a sprained ankle, boy I ain't nothing to play wit'"
John the Revelator gets it. He knows the Christians in the first century are feeling the pressure. Everything is going south. The world is messed up. It's the Eleventh Hour. So he gives them a vision of the Risen Jesus. "Remember me?" Jesus says to the early Church. "I'm the one who walked out of the tomb. Death ain't got nothing on me. I was there when all of this was created--I'll be there to make it new in the end. Why ya'll trippin'? I got you!" Maybe it's the street Greek talking, but I can hear some LL Cool J happening in these lines--"Don't call it a comeback, I've been here for years rocking my peers and puttin suckas in fear!" And what John is essentially saying to these early Christians is, "Keep the faith! Have hope! Don't give up! Jesus won when he rose from the dead! The rest is just mop-up duty! One day all of this is going to be right--all of it!" The early Christians had this crazy idea that evil had really been defeated when Jesus rose from the dead. The problem: Evil didn't get the memo. It still thinks it has power over us. Sometimes it feels like it does. When we have a few weeks like the ones we just had--it starts to feel like it, doesn't it? Maybe some of you are feeling this so strongly right now it hurts. You got a bad diagnosis. You lost someone you love. Your aging parents are starting to fail more and more quickly. Your adult child is going through things you can't save them from like you used to when they were little. You stare at your bank account hoping that it will grow to meet the stack of bills on your kitchen table. Some of us have a really hard time with this. We think that people who walk around saying things like that are a little too Christian, if you know what I mean. We're like, "Bless your heart!" We all know what "bless your heart" means in Southern-speak, am I right? "Bless your heart! I'm so glad for you that whatever that is seems to be working for you, but for the rest of us there's all the reality and stuff to think about." It's not that we don't have faith. We do. But the blessings, the rescue, the hope, the feelings of joy that elude us---those things happen to other people. Then there are a whole bunch of us who are convinced that the world is going to end so we kind of secretly don't have a lot of hope--at all. I even know some Christians who get really excited in a warped sort of way when there's widespread violence, destruction and the like. They see these things as "signs" that their generation will be the one that will see the end of the world. And there's all kinds of strange beliefs about how that looks for Christians and non-Christians. Did you ever wonder if maybe we're just focusing on all of the wrong things? When the only news you hear is bad. When all you see on Facebook is negative and fearful. When your conversations with friends constantly turn toward topics that fill you with hopelessness, anxiety and dread... it's probably a sign that Evil is having a field day with your heart. Because seriously... there are so many incredible things happening all around us that fight back the darkness. Stories of hope and goodness. Evidence that despite the way Evil wants to bluster and make it sound like it's winning---the Alpha and Omega, the Beginning and the End---the one whose last name is truly Ever and whose first name is truly GREATEST has been and will always be in charge. The darkness doesn't get to win. It just doesn't. I want us to watch this video of a French father and his son who were being interviewed on the site of the terrorist attack in France. They came to put flowers at the site of the massacre outside the Bataclan nightblub. The reporter asks the little boy if he knows what happened and why the ISIS terrorists shot so many people. Come on! How could you not just weep when you see this? How can you not look into that little boy's face and just know that this is a moment of resurrection, hope and peace? "They might have guns, but we have flowers..."
"They might have terror and fear and rage and violence... but we have the flipping ALPHA AND OMEGA---the was, the is, the shall be." If you believe in this Jesus that we are talking about let me ask you a question or three. Why are you afraid? Why are you angry? Why should any of the things Evil can toss at us make you in the least bit worried? The King is Coming. Can you see it? HAVE YOU HEARD THE GOOD NEWS? JESUS IS IN CHARGE.